Calpump CFS-155T Barrel Filter: Attach to your pump in order to keep out larger solid particles. Calpump Foam prefilter for CFS155T: Add biological filtration to your pond pump using the Calpump Foam prefilter for CFS155T. Calpump positioning bracket for S580/S900/S1200: Secure your Calpump Stainless Steel Pumps using the Calpump Positioning Bracket. 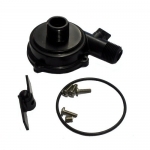 Calpump S1200T Repair Kit:The Calpump S1200T Repair Kit easily replaces worn or broken parts on your existing stainless steel pump.